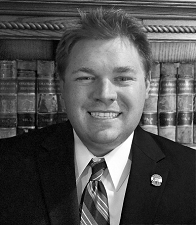 Zachary Reams, shareholder of Reams & Reams, is a lifetime resident of Grand Junction. He graduated with a Bachelor of Arts from Colorado State University with an emphasis in Economics and a minor in Business Administration. He received his Juris Doctorate at Oklahoma City University School of Law, and he was admitted to practice law in Colorado in 2013. Before his career as an attorney, Zachary Reams worked for the Colorado Division of Wildlife and the Colorado Natural Heritage Program as a GIS Analyst, where he helped digitize wildlife and wetlands across the State of Colorado. Mr. Reams specializes in probate, trust and estate, and conservatorships, with emphasis in Medicaid and litigation. Zachary Reams was appointed the Deputy Public Administrator of the 21st Judicial District of Colorado in 2015. He also focuses on landlord/tenant, real estate, and general business law.